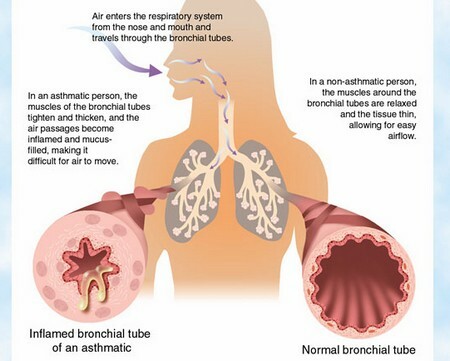 Bronchial asthma is a chronic condition that causes attacks of breathlessness and wheezing. Your bronchial tubes swell up and lung secretions increase, which tem­porarily lessens or closes off the air to your lungs. If you have asthma, you may be allergic to substances outside your body (extrinsic or allergic asthma). Or some unknown factor within your body can cause it (intrinsic or chronic asthma). Although it’s usually thought of as a childhood disease, it can develop at any time in your life. 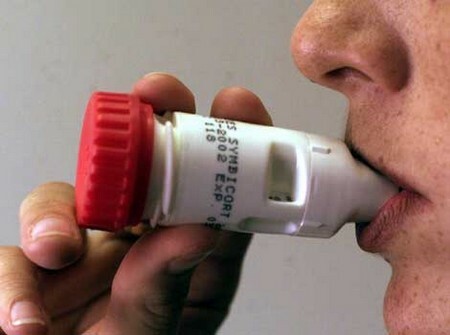 As many as 15 percent of people in the United States over the age of 45 have some form of asthma. Once your doctor has diagnosed your condition, you need to follow the health care plan she has set out for you. The actions you take and the way you manage your environment can have a huge impact on your asthma and how comfortable it is to live with. Try our tips and techniques to give asthma a bit part rather than a star­ring role in your life. Watch for the warning signs. When you feel tired and get a headache, itchy throat, runny nose, and a funny feeling in your chest, chances are you’re about to have an asthma attack. Other common warning signals are breathing changes, feeling easily upset, glassy eyes, dark circles under your eyes, paleness, sweating, coughing, sneezing, and dry mouth. Whatever your specific signals, get familiar with them so you’ll have some advance notice when an attack is coming. Have a plan of attack. Keep your asthma medicine with you at all times so you’re prepared for an attack. During an asthma attack, sit upright. This helps you breath a little easier than when you’re lying down. If the attack comes on after you’ve been exercising, rest and sip some warm water to help thin secretions. Use your bronchodilator as your doctor has recommended. You cough or wheeze continuously. You have severe shortness of breath or tight­ness in your chest. Your breathing slows or becomes shallow and fast. Your shoulders hunch over as you try to catch your breath. Your nostrils flare as you breathe. It becomes difficult to talk or concentrate. The skin around your mouth looks slightly gray or blue. These are signs of a serious asthma attack. You need to get medical treatment immediately. Make plans with your family ahead of time so they’ll know how to get help quickly if such an emer­gency should arise.